I came across this magnificent tree at a very busy intersection in Neutral Bay. I asked as many locals as I could find if they knew what it was without any success. I called and spoke to the responsible "tree man" at the local council without success. He could tell me that it was the only one in the area and he thought it could be about 20 years old. Can anyone help? It is about 6 metres high and maybe 8 metres wide and covered in these flowers which are around 10 cms in diameter. I should add that the trunk in the photograph is on a different tree, I only used it as a prop for the flower. The tree is currently losing the flowers. 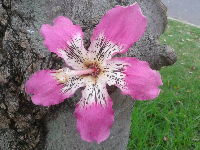 The tree looks to me like Chorisia speciosa - Floss Silk Tree. The leaves are a rather like a maple - a few leaflets spread like a hand. The trunk can get spikey with age, or more bulbous at the bottom. If grown from seed the flowers can vary in their pink colour from pale to red, and the centres from white to yellow marked red or brown. They call it a Kapok Tree in South Africa. I had one in the garden (many moons ago!!) when we lived there. Comment on "What is this gorgeous tree?"